RCE LLC © 2019 All Rights Reserved. This list will change as some items are sold and others are added to the list. If you don’t see what you want it will likely be available later. Some items such as 22LR to 224 jacket maker sets are always in stock. Bullet reducers, jacket trim sets, jacket notching tools, and other special purpose dies or tools may not be listed but are standard items, just not in-stock at the moment. To order please go to the “How To Order” page. Converts fired 22 LR cases into 22 caliber jackets. 22LR cases will make about a 50 grain flat base, open tip bullet with a 6S spitzer ogive. 22 Stinger cases will make around a 60 grain FBOT bullet. 22 Shorts make about a 45 grain FBOT bullet. If a lead tip bullet is made a little heavier bullet is possible. Note that this set only makes the jacket. A bullet swaging set is needed to make the bullet. A core seat punch for the RF jacket is needed and is included with the bullet swage die set. Replacement punch for the 224 jacket maker. Converts fired 22 LR or 22 Stinger cases into 6 mm jackets. The jacket made is a little short for the caliber so a soft point bullet is usually made. A bullet swage die set is needed to make the bullet. The jacket maker only makes the jacket. Replacement punch for the 243 jacket maker. Converts fired 22 WMR or 22 WRF cases into 6 mm jackets. 22 WMR cases make about a 100 grain flat base, open tip bullet with an 8S spitzer bullet. The 22WRF case makes about a 90 grain FBOT bullet with the 8S ogive. A core seat punch for the jacket is included with the jacket maker. Replacement punch for the 22 WMR jacket maker. Redraws a 243 (6 mm) bullet jacket to 224 caliber. Most commercial jackets like those made by J4/Berger Bullets, Sierra, or Hines can be used. 243 jackets have a bit thicker walls than do 224 jackets which means the 224 jacket will also have a thicker wall than commercially made 224 jackets. This can be an advantage when making hunting bullets or for use with very high velocity cartridges. A smaller core swage, smaller core seat, and smaller lead wire will be needed. A core seating punch is included with the set. Sorry no photo as yet. Haven’t had time to take photos. Redraws a 243 (6 mm) jacket to 224 caliber. The 243 jacket is reduced in diameter but the jacket wall is not thinned which makes a thicker than normal 224 jacket. Good for hunting bullets or for high velocity cartridges that might “blow up” normal bullets. A special core swage die is part of the set and two core seat punches for the redrawn jacket. J4/Berger Bullets, Hines, and Sierra jackets can be used. Lead wire or cast cores with a diameter of .170″ to .175″ can be used in the core swage die. Redraws a 30 caliber jacket to 264 caliber. The redrawn jacket can be trimmed to various lengths. A core seating punch is included. Trim die, scrap stripper, and core seat punch are not in photo. Redraws a 9 mm or a 380 ACP case to make a 358 caliber jacket. The jacket made can be used to make .355″ up to .358″ diameter bullets. The set includes the draw die, draw punch, and a core seating punch. Makes jackets from fired cartridge cases for the .366 caliber bullets. Only makes the jacket. A bullet swage set is also needed to make bullets. Converts fired 223 Remington and 5.56 NATO cases into 375 caliber jackets. A core seating punch is incluced. Converts fired 40 S&W cases into 375 caliber jackets. The cartridge case is annealed and reduced to make a 44 caliber jacket. Then the 44 jacket is reduced again to 375 caliber. Reducing the case in two steps greatly lessens the force needed to do the job and provides two useful jackets. Includes a 375 open tip core seat punch. Only makes the jacket. A bullet swage set is needed to make bullets. Converts fired 40 S&W cases into 40 caliber jackets suitable for handgun calibers or light rifle bullets. Includes a core seat punch. Only makes the jacket. A bullet swage set is needed to make bullets. Converts fired 40 S&W cases into 44 caliber jackets. The jackets can be used to make .429″ to .431″ handgun bullets. A core seating punch is included with the set. As always a bullet swaging set is also needed to make bullets. Resize fired 45 ACP cartridge cases to make 452 caliber jackets. Includes the jacket die and a core seating punch. For the Walnut Hill press. Use 308 Winchester, 7.62 NATO, 8 mm Mauser, or other cases with the same head diameter to make 458 caliber jackets. Includes a core seating punch. Only makes the jacket. A bullet swage set is need to make bullets. Resizes .329” bullets (Hungarian Steyr) to .323″ (common size 8 mm) diameter bullets. Resizes 358 rifle or pistol bullets to .355″ diameter. For the Walnut Hill press. Resizes .366″ (9.3 mm) bullets to 358 caliber. Resizes .458″ jacketed bullets to .451″. Use in the Walnut Hill press. Resizes .454” bullets (old 45 Colt size) to .452” diameter (45 ACP & others). 45 caliber Base Protector die set for the Walnut Hill press. The set makes a copper disk that is swaged onto the base of a lead bullet. Copper strip that is 1″ or 3/4″ wide and between .025″ to .032″ thick can be used. The disk has a small hole in its center through which lead flows to form a rivet head that holds the disk to the bullet. The disk protects the base of the bullet from damage by powder grains and from the hot powder gasses. Fits .450″ to .460″ bullets. An internal rivet punch is included. 44 caliber Base Protector die set for the Walnut Hill press. The set makes a copper disk that is swaged onto the base of a lead bullet. Copper strip that is 1″ or 3/4″ wide and between .025″ to .032″ thick can be used. The disk has a small hole in its center through which lead flows to form a rivet head that holds the disk to the bullet. The disk protects the base of the bullet from damage by powder grains and from the hot powder gasses. Fits .428″ to .440″ bullets. An internal rivet punch is included. 35 caliber Base Protector die set for the Walnut Hill press. The set makes a copper disk that is swaged onto the base of a lead bullet. Copper strip that is 1″ or 3/4″ wide and between .025″ to .032″ thick can be used. The disk has a small hole in its center through which lead flows to form a rivet head that holds the disk to the bullet. The disk protects the base of the bullet from damage by powder grains and from the hot powder gasses. Fits .350″ to .360″ bullets. 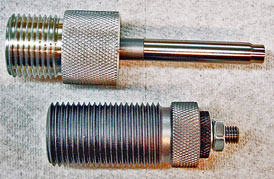 An internal rivet punch is included.